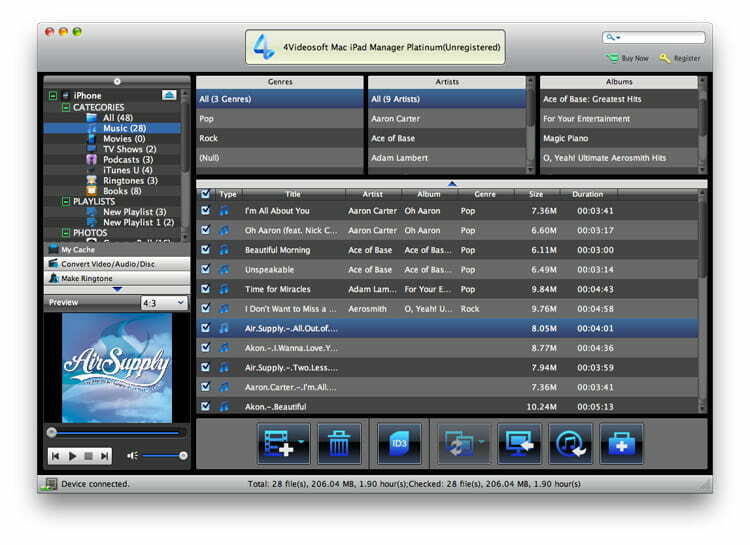 4Videosoft Mac iPad Manager Platinum allows you to transfer your files like music, movies, photos, e-books, ringtones, etc. between iPad and Mac with high speed and quality. You can convert DVD movies and general videos to your iPad freely. You can optimize the output video with the splendid editing functions such as trim, crop, merge and more. 4Videosoft Mac iPad Manager Platinum can help you transfer the local files to your iPad easily. And it enables you to transfer iPad files like e-book, ringtones, movies, photos, music, etc. to Mac without any loss. Besides, you are allowed to transfer files between two different devices. It can help you backup SMS and Contacts to avoid mistakenly deleting. This Mac iPad Manager Platinum enables you to convert DVD movies and popular videos to the iPad MP4, MOV and M4V. These converted videos can play on your portable devices like iPad 4, iPad mini, iPhone 5S, iPhone 5C, iPhone 5, iPod touch and more. 4Videosoft Mac iPad Manager Platinum enables you to make ringtone for your iPhone with local songs, and you can make them with DVD movies and other video files. The Mac iPad Manager Platinum provides you with splendid editing functions so that you can edit the output video to have a better video effect. You can modify video effect by adjusting brightness, contrast, saturation, hue and volume. You can also reset video length and frame as well as add your favorite text and image watermark. It allows you to merge several videos into one. What’s more, you can edit the ID3 information as you like. Prospects: it\'s all in the list - gather your trade show & event informationThis program is generally used at trade shows or any gathering where it is important for you to display a corporate image as you collect information from prospects. Aiseesoft PDF Splitter, the best and most professional PDF splitting tool, can provide you with powerful function of splitting any multi-page PDF file to some small PDF files. JPG to PDF Converter Software images into PDF format quickly. TIFF to PDF image maker supports batch multiple image conversion on a single click. JPG to PDF converter utility help to create single page as well as multipage JPG files into PDF pages.